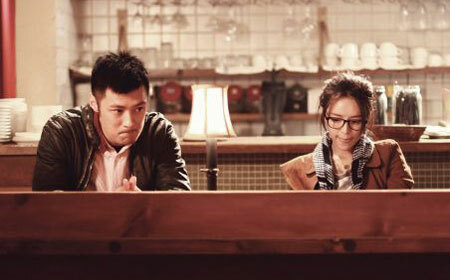 Shawn Yue and Zhang Jingchu share a moment in Lacuna. Lacuna is a light, low-tension journey into the Beijing night. This follow-up to Derek Tsang and Jimmy Wan's Lover's Discourse is more playful and relaxing but also less impactful. Light and inessential, with nice lead performances from Zhang Jingchu and Shawn Yue. Lover’s Discourse co-directors Derek Tsang and Jimmy Wan return with their second film Lacuna, a light urban romance with style and smarts, if not complete satisfaction. Shen Wei (Shawn Yue) and Tong Xin (Zhang Jingchu) wake up one morning in a furniture showroom bed, with no idea what happened or even who the person in bed with them is. The two split with few words, but each is missing something: Shen Wei can’t find his Audi, lost somewhere during their drunken travels, while Tong Xin misplaced US$300,000 dollars. The money came from Tong Xin’s film director boss, and was intended as a payoff to actress Meng Qiqi (Mia Yam) to sever their relationship. However, Qiqi said “no” to the cash and Tong Xin has a hard time remembering the rest. Drinking champagne, shotgunning beers and licking toads will do that to you. Yep, Lacuna has toad licking – a slightly edgy detail that fits producer Pang Ho-Cheung’s self-amused sensibilities rather well. Lacuna is the “1” part of Pang’s “4+1” project – a feature-length film following four made-for-the-mainland shorts, with many of the same collaborators (Tsang, Wan, Yue, Zhang and also D.P. Charlie Lam) returning. Technically, Lacuna is pleasing, with Beijing depicted attractively and in a grungier manner than the usual high-class China romcoms. Shen Wei and Tong Xin eventually meet to retrace their steps, with each stop showing different facets of Beijing. Some details are not that credible (How did Tong Xin and Shen Wei visit so many places in one evening? ), but the journey is well-constructed and the concept sound. This is a movie where two strangers are thrown together unexpectedly and learn to like (or maybe re-like) each other along the way. Hollywood makes these films, like, all the time. Unfortunately, Lacuna doesn’t always engage. The opening is handled in smart comic fashion – the two wake up, realize they’re in an IKEA-like store and then part awkwardly – but the following developments aren’t always interesting or funny. A host of characters turn up, from Tong Xin’s ex-boyfriend (Zhu Yuchen) and friend (singer Yoga Lin) to Shen Wei’s co-workers and his pal White Hair (Laurence Chou), but many scenes involve people sitting around bantering or not knowing what to say to one another. Oftentimes the meetups lead to flashbacks about what Tong Xin or Shen Wei did the previous evening, but some of the content is repetitive. Shen Wei and Tong Xin’s toad-licking is first seen on a video clip and then re-shown multiple times from other perspectives. This isn’t Rashomon so that much toad-licking is not necessary. Also, aside from an early reunion and a detour to a film shoot (where Shen Wei and Tong Xin don beards for a nativity scene), Lacuna lacks key moments to mark its progression. Shawn Yue and Zhang Jingchu are both fine, with Zhang edging Yue thanks to more character details and greater stakes. Tong Xin is harried at work, just suffered a breakup and is missing 300,000 dollars that is not hers . She also must tolerate videos depicting her drunkenness and toad-licking splashed all over Weibo. Shen Wei is in the videos too, but the missing car is his and if he loses it, well, tough cookies Shen Wei. Shawn Yue is relaxed in the role and depicts Wei as being somewhat deferential to Beijingers – perfectly understandable behavior for a Hong Kong transplant in the mainland. His character is mostly seen by how he treats Tong Xin, and the two establish a nice, subtle connection that’s worth appreciating. The subdued nature of the film works against them, however, as there’s never a strong impetus for the two to hook up besides the fact that they apparently already did.